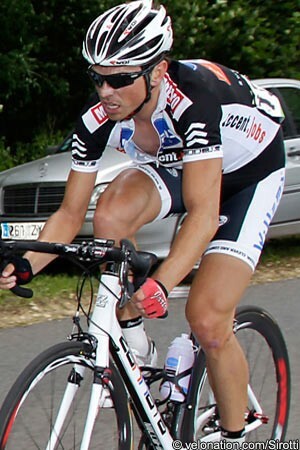 An incident at the end of the 2011 Paris-Tours has landed Jurgen Van Goolen in hot water with French police, with the rider now facing possible charges due to a tussle with a female gendarme. The Veranda's Willems – Accent rider was part of the early seven-man break which shaped the race, and was fighting for a possible top-ten finish when he crashed within sight of the line. A flustered Van Goolen tried to put his chain back on his bike and continue on to the finish, but a female police officer took hold of the handlebars and this led to the dispute. Spectator footage from the incident [see below] suggests that she may have been trying to pull Van Goolen closer to the barriers prior to a big group sprinting in, but things turned more serious when the rider, who was fully focussed on getting back on his bike as soon as possible, resisted. In trying to get space, a frustrated Van Goolen struck a glancing slap to her arm, then later pushed her when she refused to let go of his bike and let him finish. French police are yet to comment on the matter and give their perspective of what happened. Greg Van Avermaet (BMC Racing Team) won the race, outsprinting Marco Marcato (Vacansoleil-DCM Pro Cycling Team) to the line. Van Goolen’s spill and tussle saw him finish 77th, over two minutes back.